The Chimichurri Fried Chicken Sandwich and the Top Hat’s house-made tater tots aren’t vegan or vegetarian, but they are delicious — and popular. Thai tacos are a new vegan option at the Top Hat: They are made with seitan, a meat substitute that really does have the texture of meat. There’s a pork version, too, for those who prefer traditional fare. Thankfully, the season of fresh, local produce is nearly here to inspire spring and summer meals. And many restaurants are helping, too, adding notes on their menus — V for vegan; DF for dairy-free; VEG for vegetarian; GF for gluten-free — to guide people who want to eat a certain way, even when dining away from home. At the Top Hat restaurant in downtown Missoula, head chef Billy Metzger and his staff are giving some extra attention to healthy dishes, and adding more vegan and vegetarian specials and options, too. In January, they highlighted a “Resolution Menu,” which offered a few items tied to Paleo and Whole30 eating programs popular for people trying to shift eating habits. Paleo emphasizes lean meats, fish, eggs, vegetables, fruits, nuts and seeds, herbs and spices; Whole30 is a 30-day, reset-your-eating plan that eliminates sugar, processed foods, legumes, grains and dairy, at least for a while. Lots of people start these programs in January and “find it very hard to eat out,” Metzger said. He wanted to encourage them to come in with some specials, like a Mongolian salad of baby kale, orange, radish, carrot, sautéed onions and peppers, with a turmeric-apple cider dressing, and a mushroom pho — broth — made with oyster mushrooms, cucumber noodles, cilantro, radish, and a green onion and ginger slaw. Fact is, Metzger said, people are trying to eat healthier foods year-round, even when eating out, a trend he sees with his own friends, family and co-workers. The Top Hat has always had a creative menu. Flatbreads are a staple; the current menu also has a Bibimbap Korean Beef Rice Bowl ($16); Blackened Mahi Tacos ($13); a Spicy Jerk Chicken Wrap ($12); and appetizers like Fried Mac and Cheese Bites or Chicken and Waffles ($8). Fish tacos ($12) and burgers ($13-$14) remain king, as does the Top Hat’s ever-popular Chimichurri Fried Chicken Sandwich ($12), Metzger said. Take a good look at plates as they go by and you’ll see lots of house-made tater tots; not everyone is choosing salad as their side. Nevertheless, people — especially Missoulians — who are trying to eat differently really want to stick to their lifestyle, even while eating out, he said. Sales of lettuce wraps and an Italian dish of pork and spaghetti squash — which met Paleo and Whole30 criteria — and the Mongolian salad rivaled sales of more traditional fare, he said. The restaurant’s newest menu includes two dishes using seitan, a meat substitute made with white beans, wheat gluten and nutritional yeast. For a vegan Italian flatbread, the seitan is seasoned, rolled into a sausage and steamed for 45 minutes, grilled and cut. Add house-made marinara, onions, peppers and cashew "cheese," and it satisfies any palate’s craving for pizza. Seitan also is a central ingredient in another menu offering: Thai Vegan Tacos. For this, the seitan is sautéed in sesame oil and Thai chili marinade to make a taco filling — its texture really will remind you of meat — and served with a pepper-peanut-coconut sauce, cilantro, cucumber, pickled carrot and picked daikon radish. The Thai tacos also are on the Top Hat’s happy hour menu, the first vegan dish to be offered there, according to the restaurant. 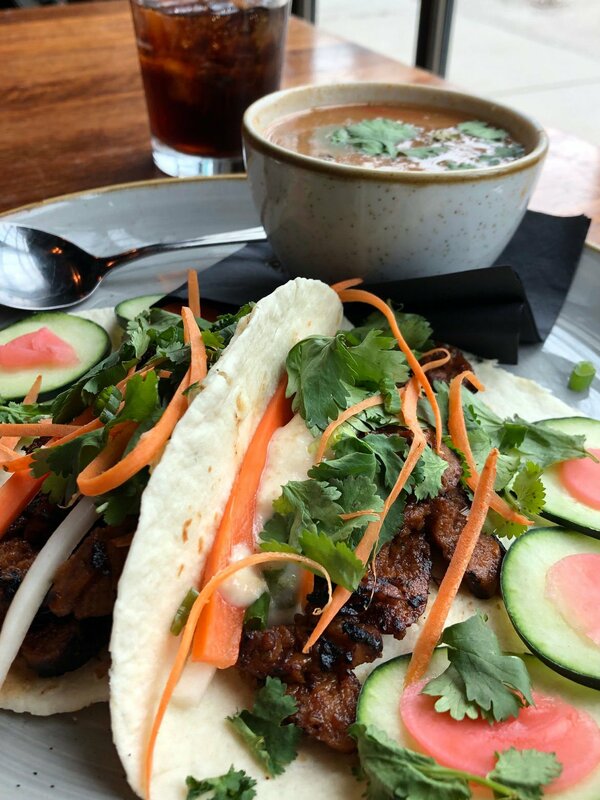 Happy hour (from 3-6 p.m. daily) is a good time to save a few dollars on selected items and drinks at the Top Hat: For instance, the Thai tacos are $9 during happy hour, $11 at other times. The Top Hat will always have a menu with burgers and other traditional favorites, all with special twists that set them apart, like the pepper-infused pickled avocado on one burger or the house-made fettuccine with shrimp, sausage, onions, peppers and a cream sauce for the Cajun Pasta. But vegan, vegetarian, gluten-free, dairy-free, Paleo and other offerings will be featured, too, with specials and new dishes explained on Facebook or Instagram, Metzger promised. The Top Hat, 134 W. Front St., is open 11 a.m. to 10 p.m. Monday through Saturday (may vary for ticketed events). Happy Hour is 3-6 p.m.